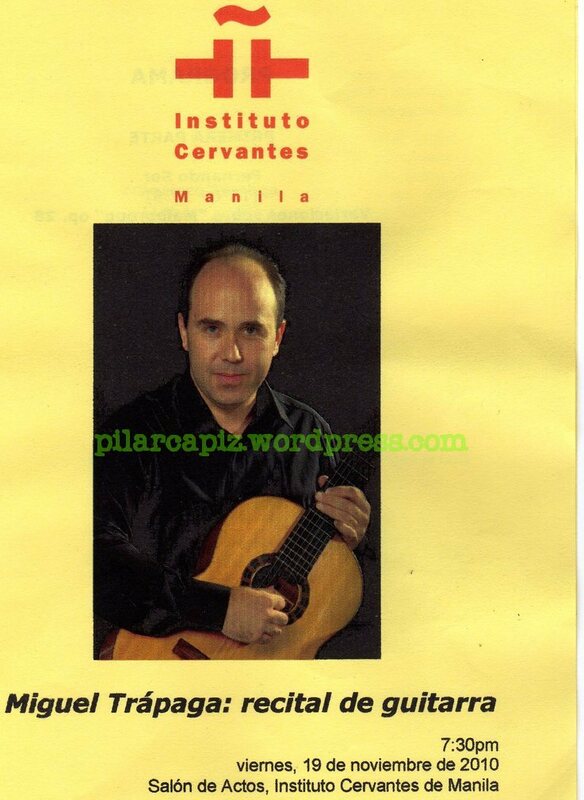 Front cover of the concert program with the picture of the Spanish classical guitar performer, Miguel Trapaga, himself. 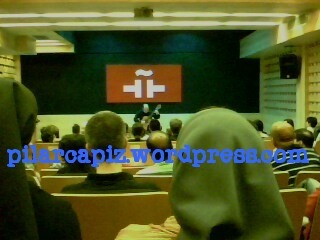 I was in Instituto Cervantes twice last week. First was on Thursday (18 November 2010) to participate in the workshop for advanced classical guitar players conducted by the Spanish Maestro Miguel Trapaga, and second on Friday (19 November 2010) to watch his concert. 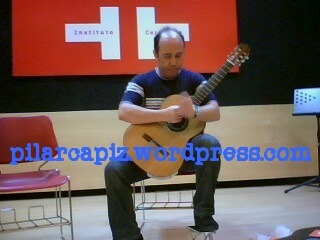 The Philippine Daily Inquirer announced that on 17 and 18 November 2010, said Spanish guitarist was holding a workshop. I went on the 18th and I brought with me my classical guitar. When I entered the hall, Miguel was talking in Spanish with probably a staff of Instituto. There were only me, Miguel, the Instituto staff, and another balding middle age business man by the name of Sam. Sam was there perhaps only to ask questions or converse with Miguel. He said he was taught by Valdez, but he did not bring his guitar. Later, when Miguel brought out his guitar from its box, Sam asked if it was the same guitar Miguel brought with him to the same place three years ago. Miguel said yes. Miguel Trapaga during Thursday's rehearsal. idea. Perhaps, the Instituto staff understood me, so he instead offered us the opportunity to watch Miguel rehearse for his concert the next day. I said, it would be an honor. But Miguel insisted that he conduct a short session with me. He asked if I was ready to play. I told him I was although I would rather watch him rehearse. But Miguel “forced” me. So, I obliged. Against my will, I undressed my guitar and put it on my lap, and my left foot on the footstool. Miguel was watching me from my left. He also took out his guitar and placed his foot on his shiny and silver footstool. We were at the center of the stage of Salon de Actos of Instituto Cervantes de Manila. There were Sam and the Spanish guest Miguel was talking with a while ago for our audience. When I reached the second part of the piece, Miguel asked me to stop. By his hand gestures, I understood that my playing irritated him. He would ask me to play the beginning of the first part of the piece over again and every time he would say I was getting better. I was in three master classes in the Guitar Festival organized my University of Sto. Tomas last August, and I did not understand why the students during the master classes were so nervous during their performance. As I played for and before Miguel, I also did not understand why I was so nervous. I am no longer telling you in detail what Miguel told me about my performance because I do not want to further embarrass myself. Instead, let me just summarize it: my finger was wrong, I did not play the notes continuously, I did not observe the correct phrasing… in short, it was a disaster. In fairness to me, though, Miguel said my right hand was properly placed. I wanted to kiss him. What I should do, Miguel said, was to always think of the last person at the farend of the hall. I have to make sure that he hears my every note clearly and distinctly. He also asked me if I knew something about music theory and I told him I know nada. It’s good for me to learn music theory, Miguel said. When I arrived home, I typed in Google the phrase “music theory” and read everything I could. Honestly though, I felt like I was dead. I will never be able to play really well because my guitar was no good. It was cheap. It played the wrong notes for my first ever master class and with a Spanish maestro. I got even by not touching my guitar for two days afterwards. Miguel Trapaga in concert. At the foreground are two Hijas de Jesus nuns' veiled heads. I talked with them in the parking lot after the concert. Colegio de las Hijas de Jesus in Iloilo City trained all my sisters to do well in College and thereafter. On the 19th, I dragged the poet in Filipino and literary critic, Rebecca T. Anonuevo, with me to watch Miguel’s concert scheduled at 7:30pm. The front section of Salon de Actos was reserved for the dignitaries and perhaps the employees of the Spanish embassy and Instituto Cervantes. 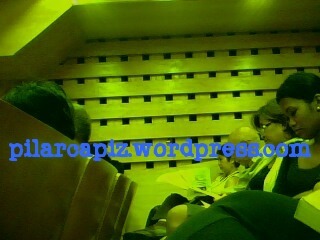 The guests were seated at the back section. I was seated in the middle of the row. Rebecca was on my right, and Jenny De Vera, a guitar major 2008 graduate of the University of the Philippines and Guitar Friends member was at my left. Jenny and I became Facebook friends after she read my very long article on the first UST International Guitar Festival. It was our first meeting in person. During Miguel’s performance, Jenny was there to guide me which of the pieces that was printed on the program Miguel was now playing. Jenny was in the concert not only to watch Miguel, but also to promote the 2011 Philippine International Guitar Festival & Competition sponsored by her group, the Guitar Friends, and the Cultural Center of the Philippines. It will be on 27 to 30 January 2011 at CCP Little Theater. There will be concerts, competition, workshops and free master classes for beginners and display of world class guitars, and many more. The hall was very silent during the performance. I had this feeling that if I breathe normally, the sound of the air coming out and going in my nose would resound throughout the hall and disturb the performance. I was really scared to breathe; I felt I was drowning. Grandpa reading a Spanish newspaper during Miguel Trapaga's concert. But the more careful I was, the more careless was the old man at the end of my row at my right. Imagine, Miguel was playing in front of the hall on the stage while grandpa was reading a newspaper, a Spanish newspaper! Every time he flipped through the pages, he made so much noise that I was not the only one who could not help but glanced at him. Miguel played Variaciones sobre “Malboroug” op. 28 by Fernando Sor, Sonata BWV 1001 by J.S Bach for the first part of his concert. Towards the end of Bach’s Sonata, the old man was now really very impatient and perhaps irritated. WTF is he doing with his guitar, I could imagine grandpa wanted to say. So, he kept “whispering” adjectives of dislike to his companion. At one point he said to her “this is punishment”. The solemnity of the hall and the quality of Miguel’s performance, however, made his statement funny. In fact, very, very funny. His companion was enjoying with us, I guess, so she waived her hand to shut the old man up. Sometime in August, during Manuel Cabrera II and Meng Feng Su’s concert in PhilamLife Auditoriom in U.N. Avenue, we had almost the same experience. Two rows away from and in front of the stage, a fat man in his white shirt was resting his head on the back of the seat, his face upward, and he was snoring so loudly during Meng Feng Su’s performance his snoring drowned some of the notes and became very audible in between pauses. We were so embarrassed for him. When Mr. Su finished, the man woke up, as if on cue, and frantically clapped his hands for Mr. Su. Perhaps a thank you for Mr. Su for putting him to a very sound and peaceful sleep during his concert. Grandpa was glad the first part was over, the short break gave him time to leave the hall without further disturbing us. For the second part of his concert, Miguel played Viento de Primavera by David del Puerto, Dos preludios and Capricho Arabe by Francisco Tarrega, Impromptu and Guajira by Emilio Pujol, Fandango Variado op. 16 by Dionisio Aguado, and Rondenañ by Regino Sainz de la Maza. Of all the pieces he played, Francisco Tarrega’s Dos Preludios and Capricho Arabe were our favourite. I told Jenny that those will be the kind of pieces I will be playing someday. Jenny nodded her head. 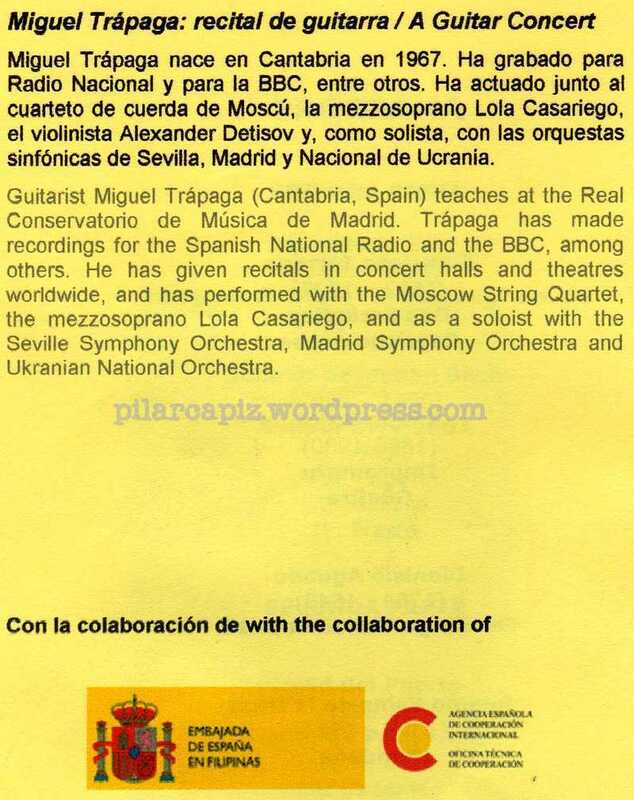 Back cover of the concert program with the short bio of the Spanish classical guitar player, Miguel Trapaga, in Spanish with English translation. I don’t know why guitar players have to play pieces whose melody is not arresting. To demonstrate virtuosity? What for? They are in a concert not contest. Maybe there are theories behind those not so interesting-sounding pieces, or maybe I have not developed a taste for them. I want Tarrega’s pieces. When Miguel played his pieces, the sound of the guitar gripped my chest and would have torn me apart. I felt that my soul was slowly leaving my body and I would have loved to see how the music tore apart my lousy arms and fingers, which do not know how to play classical guitar, from my heart which understands what Tarrega was talking about through Miguel’s guitar. When Miguel finished playing all the pieces written in the program, of course, the hall went wild. He left the hall and the clapping did not stop. He returned, bowed again, and played a bonus piece. After he was done, we again clapped our hands for as long as we did. But this time, Miguel did not return to the stage. So we went home happy. I read that when Indians ride airplanes, or fast vehicles for that matter, they stop for a while after disembarking to wait for their soul. The concert was over and I arrived home so fast. I thought I left my soul in Instituto. This entry was tagged 2011 Philippine International Guitar Festival & Competition, Classial Guitar, Classical Guitar Concert, classical guitar concert experience, Classical Guitar Music, Concert in Instituto Cervantes, Faux pas in guitar concerts, Guitar Friends, Instituto Cervantes, Jenny de Vera, master class, master class experience, Miguel Trapaga, Spanish Embassy, UST International Guitar Festival. Bookmark the permalink.